The new and expanded edition of Fefu and Her Friends celebrates the fortieth anniversary of the beloved play by Maria Irene Fornes, one of the most influential contemporary American playwrights. The volume includes the original version of the play, which takes place in five different environments, as well as a one-set variation, conceived and directed by the author two decades after the 1977 production. Also featured is an interview with Fornes on the play by Bonnie Marranca. 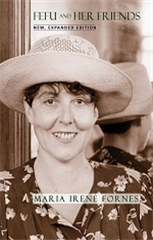 PAJ Publications has published five volumes of the author’s plays, including Maria Irene Fornes: Plays, Promenade and Other Plays, What of the Night? : Selected Plays, and Letters from Cuba. For her work as writer, director, teacher, librettist, and adaptor of classics, over more than four decades, Maria Irene Fornes has received nine Obie Awards.